Byond Tech Electronics Private Ltd, Pune has announced an awesome dual SIM smart phone named Phablet PIII which included in the popular Mi-Book series. The Byond Phablet PIII runs the latest Android 4.1.1 Jelly Bean operating system with advanced features of the smart phone solutions. The 3G smart phone is powered by a 1GHz dual-core processor with built-in graphic acceleration. Main attraction of the handset is its huge and fabulous display. 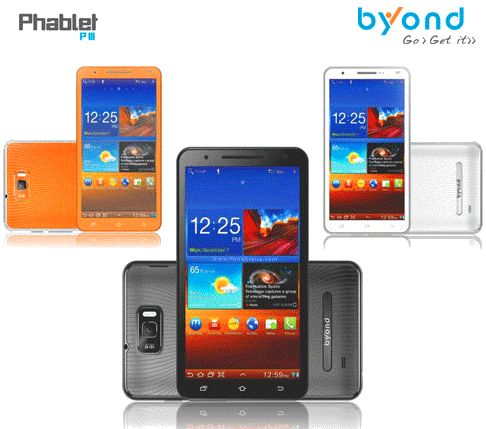 Byond Phablet PIII comes with 6 inches FWVGA high resolution 5-point touch capacitive display with 854 x 480 pixels resolution.